Talk about a fun and easy Halloween cupcake! Make your favorite cupcake, frost it in a fun Halloween color, and then make one of these topsy turvy witch leg cupcake toppers to finish it off. They even use the fun and trendy striped paper straws! 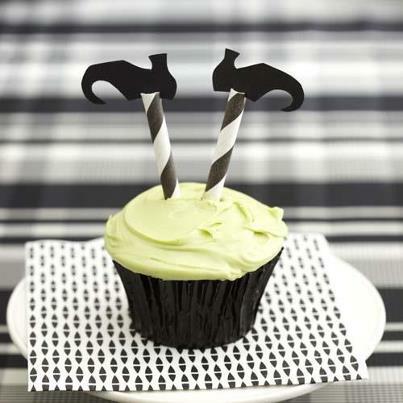 You can check out these witch leg cupcakes over at BHG. These are so much fun. I hope she isn't in there eating the sweet center part of the cupcake. I have never seen black and white striped straws...any idea for a source? Those are awesome!!! Love it! !